How to create a d3 zoomable partition chart straight from Excel. As always, acknowledgement to Mike Bostock on whose zoomable partition chart this is based. 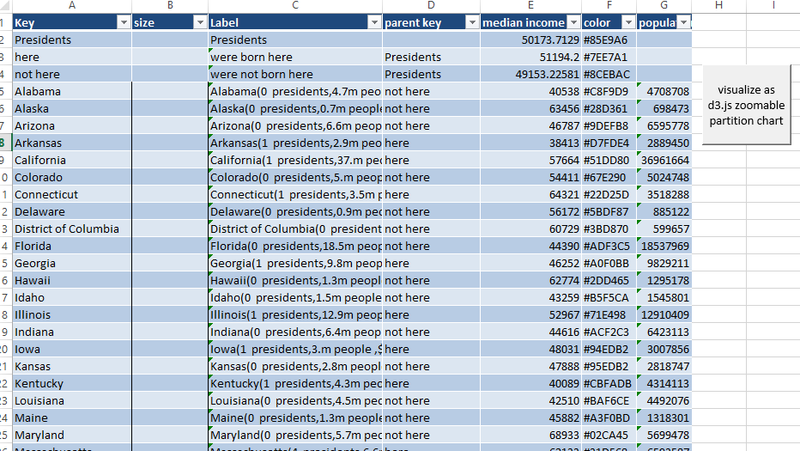 For this, i am using some data from various sources such as the US census, wikipedia and so on, to create a visualization of where presidents are born by population size, by median income by state. The data is not that important since, the object here is to show how to generate a visualization from some Excel data. The full sized example can be found here. The structure of the data is much like that used in Creating d3.js Tree diagrams, and will look like this. The data is somewhat enhanced in that we are now going to use a size property and a color property. This is used to scale the partitions. It is only necessary in the final child data, since each parent partition is scaled to be the sum of its childrens' sizes. Final child data looks like this. In this case the size represents the population of the given state. The default colors for child and parent partitions are set through style options in the chart parameters, but in this case I wanted to use a color ramp to visualize the median income of each state. I used the Color ramp library to calculate appropriate coloring for each state, using various shades of green as defined by the "greendollar" entry. Here's an example formula for calculating the color. You can download the example in the cdataset.xlsm workbook from the excel liberation site. The test data is in the d3zoompart worksheet and the options can be set in the d3treeparameters worksheet. Why not join our forum,follow the blog or follow me on twitter to ensure you get updates when they are available.